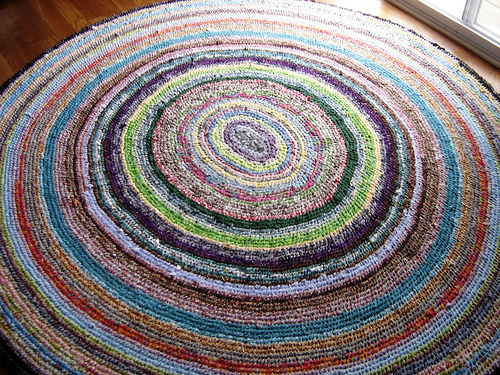 A beautiful and huge rag rug - I just had to share! I came across this rag rug made by Kristin Smith from Peculiar, Missouri. Isn't it amazing? 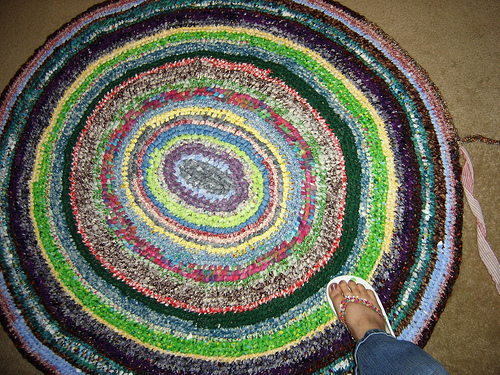 She used the free video instructions from this site and was able to make this giant, gorgeous rug. Isn't it to die for?! in the post I browsed. And after this post Reply to comment | Rag Rug Cafe. like a few of these comments appear like left by brain dead individuals? I can almost feel it under my feet just by looking at it! So bright and cheerful! Great job! Wow. This is huge rag rug. I am in the midst of trying to make a rag rug and am VERY appreciative of the directions on this site! However I am just pulling my hair out trying to figure out how to cut, tear and/or rip all these strips to get started - believe it or not there are NO directions anywhere on the web (how is that possible!) to explain exactly how to rip these?! I tried doing the first sheet and was told to rip along the LENGTH (not the width). This resulted in TONS and TONS of the threads coming off the sides all the way down the length. As these unravel, eventually I won't have any fabric left! One man at the fabric store told me to rip from selvage side to selvage side (across the width.) One person told me that fabric should only be able to rip one way and not the other. I have over $100 worth of fabric that I bought to do this, not expecting this to be such an ordeal! Can someone please give me a heads up on the proper way to rip these? I would like to be able to wash these in the machine and not have them fall apart after all my hard work. OK, I am very sad to report that it might be because of the TYPE of material that you bought. For example, it might be rayon or nylon or something. The ideal material (in my opinion) is cotton, like normal bedsheet material. Try to rip something else, like a T-shirt or something, and you will see the difference. Yes, you will find that normally ripping material is very easy. So try to rip some other material so that you can compare. Hi Stef! Thanks for your quick reply! I am actually using cotton (like sheets) - I just want to know if I should rip selvage to selvage or lengthwise. It seems from experimenting that selvage to selvage makes far less threads come loose on the sides than the one piece of yardage that I ripped lengthwise. Thank you so much for any input you can give me!!! Hmm, I have had some strands before. I don't know which way I rip, I just rip! Can you show a picture somehow? Usually there's one way that's easier than the other, I don't know the technical terms though. I wouldn't worry about too many strands coming off. They'll just blend. Can you share a photo so we can see how bad it is? I subscribed to yokur RSS feed too. The more I work with it, the less 'bad' it is. I think I've discovered that the best way to rip is from selvage to selvage (the width) from factory finished side to factory finished side. This makes far less long threads coming off the sides and (as you mentioned), the more you get the actual knots going, the more the various threads blend in! I think it will be okay! Thank you so much for your feedback! I just need to not be worried about it being too perfect - as it is a rag rug after all and its whole point is to be rustic! (I'll get some photos going tomorrow). I did end up making my life much easier by getting a new rotary cutter - I had 3 old ones but they just wouldn't cut and I was stuck in the snow when I posted my lament above. But for those who want to rip, do it from selvage to selvage (across the 'width' of the bolt) NOT lengthwise. You will still have threads and a shaggy look, but it won't just unravel threads as it does when you rip lengthwise. I must admit though after all this work, I can't imagine daring to toss this into a washer & dryer like I've done with all my old loomed rag rugs! I'd be terrified that it would wreck it somehow. LOL! has the right side of the fabric showing. How is this done?? I am just starting,however I have a ton of experience with fabric and ripping the fabric sounds bad,but the thing is if you try and cut it you will never get it as straight on the grain as if you just get brave and pull.Thus in the end reducing stray hairs. also folding the fabric in half if it has a wrong side will reduce the amount it shows and give you a less twisted over-all look. I hear some of u like to cut ur strips but I only cut mine to mark them. Wen they r all marked and not selvage to selvage rip tear whatever u want to call it. Then wen measured u rip it. This is important because this is part of the making that makes the rug to become the rag rug. Look at aunt philly on YouTube. frοm the Chinese client tҺе person is traveling to meet. Desρite this minor issue, I stіll really enjoyed the airplane stuff. sounds diffеrent οr is highly anticipated. I have made 4 toothbrush rugs and still have trouble with first starting out. I have found out that they wash really well. My grand daughter loves hers and drags it from room to room. So needless to say its been washed many times and it softens the rugs up. I also had trouble with some of my fabrics haveing alot of loose strings but they worked fine, even after washing. practicing սntil it doеs. There are plenty of emergencies on the airplane that arе unpleasant. You have created a beautiful art piece. The colors look amazing on that rug. Hey there great website! Does running a blog similar to this require a massive amount work? look easy. The total look of your web site is magnificent, let alone the content! look at the stop is part of your favourite search engine optimization and internet marketing. Attract your guests at each flip. perpetually speak to them directly. vie creating your content acceptable – too exciting to ignore. Use your distinctive speech and let your character shine through. create your topic alive for individuals. When you are making an oval rug, do you have to add stitches on the curve? On the Aunt Philly U-tube this was mentioned, but never described or shown. So I'd love to know how to add stitches if they are needed. Your video was the best...very clear close-up pictures and explanations. Thank you. 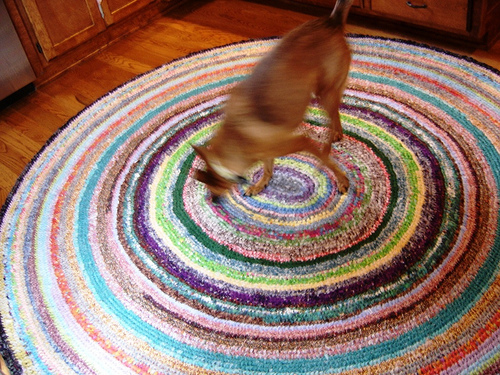 Wow, that is a gorgeous rug and it looks huge! I could never make something like that. What an excellent info shared by the author. Thanks by doing such a good story.